Sandibe Okavango Safari lodge, a Botswana game lodge in the beautiful water wilderness of the Okavango Delta offers a secluded safari experience with exceptional views of the wetlands and savanna. The site for the camp was chosen specifically for the contrast in landscapes and its natural beauty. Guests at Sandibe can spend time in a guided Mekoro or traditional dugout canoe, navigating the tranquil waterways or venture out on the Eco-craft especially during the flood season from June to September. At Sandibe Okavango Safari Lodge, visitors can take a night game drive and enjoy the thrill of spotting nocturnal animals and maybe even the shy Leopard. This Botswana game lodge has access to various landscapes and offers the chance to see large herds of Elephant and Buffalo, also Lion, Giraffe, Cheetah, Kudu and even Hippo at the water amongst many other species. When guests return to the lodge after their evening game drive, they can enjoy a wonderful alfresco dinner under the stars by candlelight and choose a wine from the unique charcoal cooled wine cellar, before turning in at their luxury safari cottage. Rolling plains stretch into the distance, etched with the silhouettes of palm trees, mud-castle spires of giant termite mounds and ancient Baobabs. 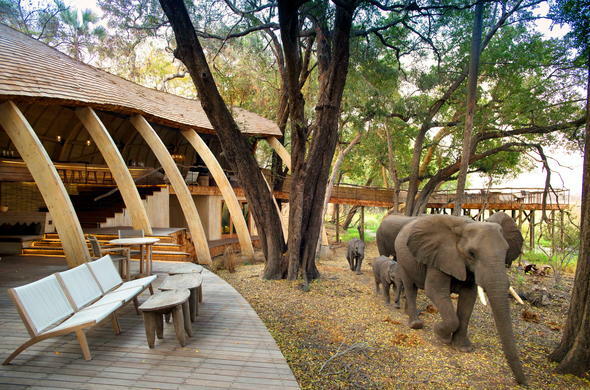 Romance is abundant at the Sandibe Safari Lodge. With gorgeous settings and tranquil surroundings, guests enjoy favourable time with loved ones.